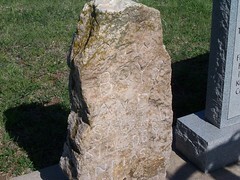 On September 12, 1878, the bodies of Reuben Bristow and Fred Clark were found near hear. 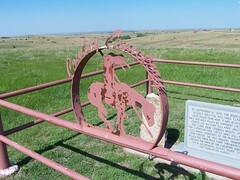 It was believed they had been killed by Northern Cheyenne Indians lead by Chief Dull Knife. 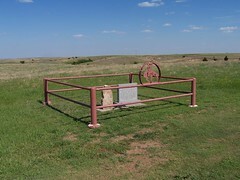 Bristow and Clark where cowboys hauling salt for Comanche Pool cattle when Dull Knife fled harsh conditions on the reservation near canton. 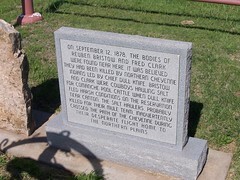 The salt haulers, probably crossed the path of the Cheyenne during their desperate flights home to the northern plains. 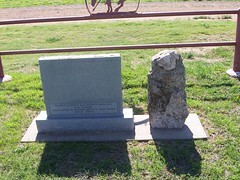 Go eleven miles north of the junction of U.S. 64 and Highway 50 north (known as Camp Houston north of Freedom, Oklahoma). Continuing north the paved road will end at a gravel/dirt road Y. 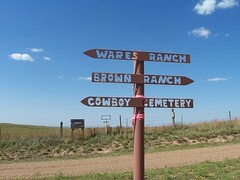 There is a sign pointing west to Cowboy Cemetery. 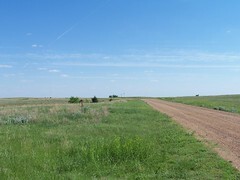 You will travel some miles west on a winding gravel/dirt road. You will come to another Y with a sign pointing to the right. 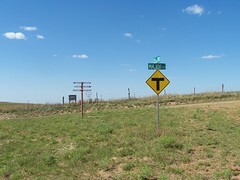 Go just a little bit down that road, cemetery is on the right. Watch for it, the cemetery's fencing is the same color as oil/gas pipelines in the area. Also watch out for cattle trucks.